Looking south on 15th Ave East from Mercer Street. Old photo from Washington State Archives, Metro collection, LS0018. I think it’s 1913. Last month I threw down the gauntlet: a new chapter in the history of neighborhood streetcar service each month until the First Hill streetcar opens. This is month number two. Will we make it to three? This month, we’re looking at a legit Capitol Hill streetcar: the destination placard actually says Capitol Hill on it. This line to James Moore’s new neighborhood opened on November 17, 1901. There was service on Broadway a decade earlier (read the Re:Take about it here), but Capitol Hill didn’t exist yet (read the Re:Take about it here) and it was one of many independently operated routes in the city. In 1899 and 1900 Seattle Electric Company took control of almost every line, and the Capitol Hill line became one of their first newly constructed streetcars. Moore described service in a big advertisement before opening day, “The new line opens tomorrow morning for the special accommodation of the best residence district in Seattle”. Initially it started at the bottom of Second Avenue and traveled up to Pike Street, then on Pike to Fifteenth, and Fifteenth to Volunteer Park (then City Park). Cars ran every 12 minutes each way, only taking a break from just after midnight to 6 a.m. Later the cars were switched to Pine Street, the same route that Metro’s #10 trolley bus takes today. My notes say that the archive has this photo dated as 1923, but I’m going to assume I failed to transcribe that correctly. It matches photos taken in 1913 of other parts of the SEC system. And look at those horses and that rickety car. They don’t say 1923 to me. 1913 isn’t too late for a scene like this. Moreover, the block is completely built out. Of the next three maps — 1905, 1908, 1912 — it is closest to 1912. 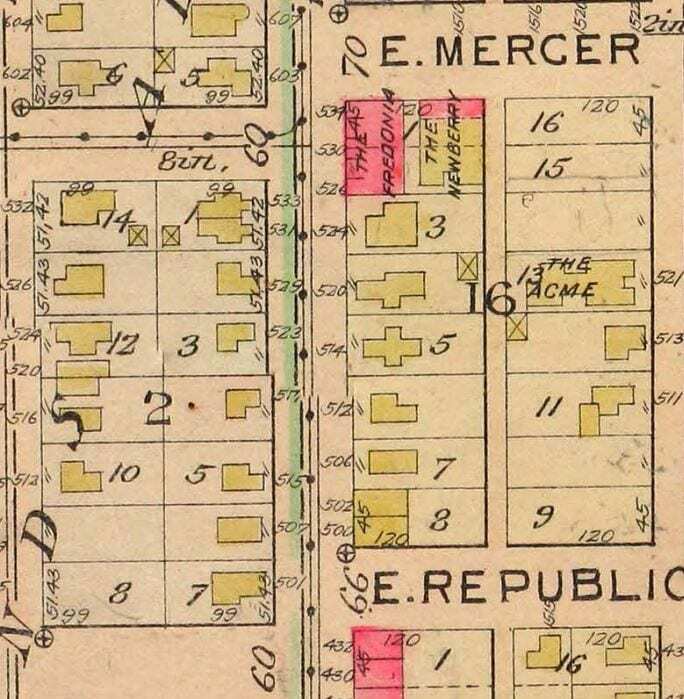 15th Ave E from Republican to Mercer, from the 1904 Sanborn fire insurance map. 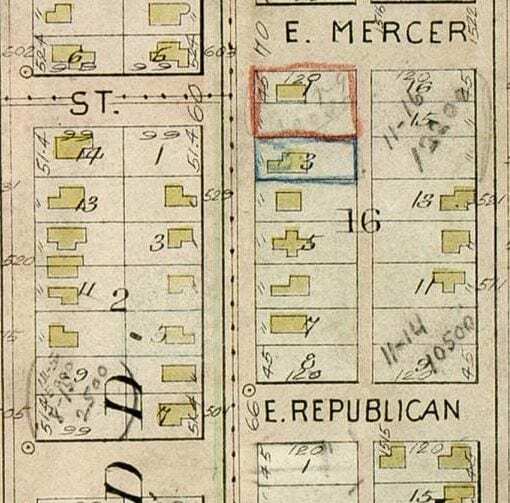 15th Ave E from Republican to Mercer, from the 1905 Baist fire insurance map. The red square is drawn in to show where the Fredonia was constructed in 1907, replacing an earlier house. 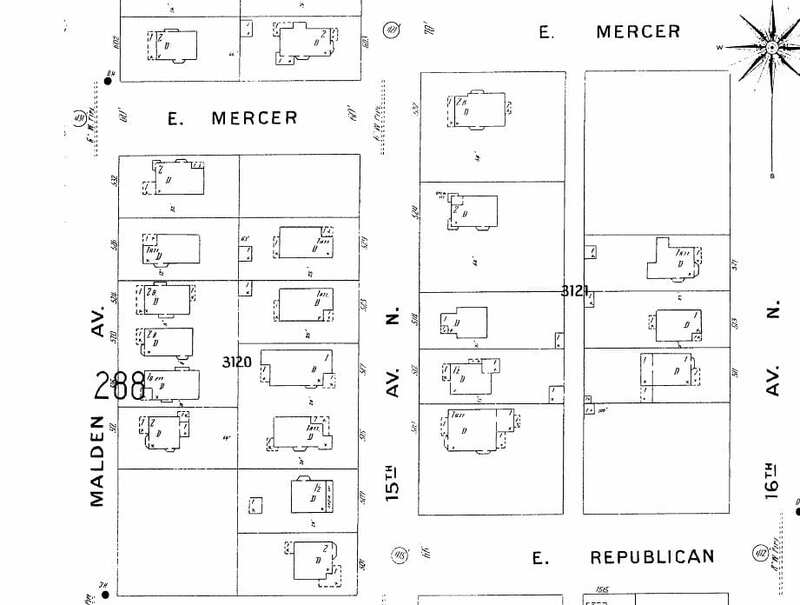 15th Ave E from Republican to Mercer, from the 1912 Baist fire insurance map. Every lot is filled along 15th, which is what our photo looks like. The only building that remains from the 1913 photo is the Fredonia. 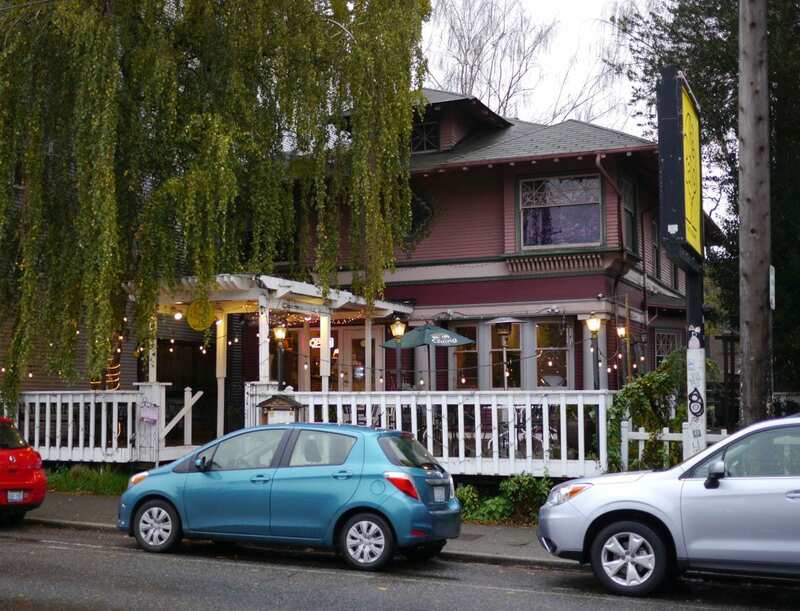 But tucked around the corner out of site is 524 15th Ave E, already present in the 1904 map. Those two buildings are all that remain from the hundred-year-ago scene. Of course the streetcar is another of the things that are gone. In August of 1940, the line was scrapped and replaced with “trackless trolley” buses. For just over a month, motor coaches were used while the tracks were demolished and trolley buses put in place. For 75 years since then, trolley buses have carried passengers from Volunteer Park to downtown Seattle. Some where there is a picture of people celebrating the removal of street cars in Seattle. I’ve seen it. There are definitely photos of people who showed up to remember the last day of service of various lines. The papers were filled with fond thoughts and sad outlooks by riders and drivers. I can’t think of any photos of people celebrating as in “thank goodness they’re gone”. 12 minute service- I wish I could see how full those trains were. They were small cars, but I agree with you. I wonder if SEC put some of the streetcars to use on other lines after an introductory period. Maybe Moore subsidized service for a few months? Not sure. What an enjoyable read. Thank you Robert for the blast from the past.